With over 30 years experience in sourcing supplying and installing stone, there is not a lot we don’t know. We are on hand to offer up to date advice on all elements of your project. Speak to one of our knowledgeable team, or email ‘Ask Tom’ and we will contact you directly. Call us today on 01962 888444. Trained staff are on hand to give advice on materials, laying patterns and designs. 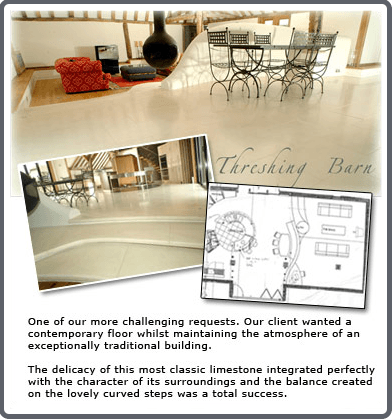 Our showrooms are designed to make the process of choosing your stone flooring as enjoyable as possible. Time spent with our staff ensures your flooring is tailored to your every requirement, its for this reason we ask you to make an appointment, to meet with us and discuss your project. The most important part of any stone floor is its installation. Laid and sealed properly, your stone flooring gets better over time. unlike other products its best day is not its first day. We employ our own Installers and an Installation manager to over see and communicate with the other parties in your project, making the process of us installing your floor a seamless and efficient process. We have put together the complete after-care pack. Including products needed to make sure your stone flooring improves with age. Our maintenance Cycle should be followed once your flooring is installed and all top up products are available to buy online or from our stores.